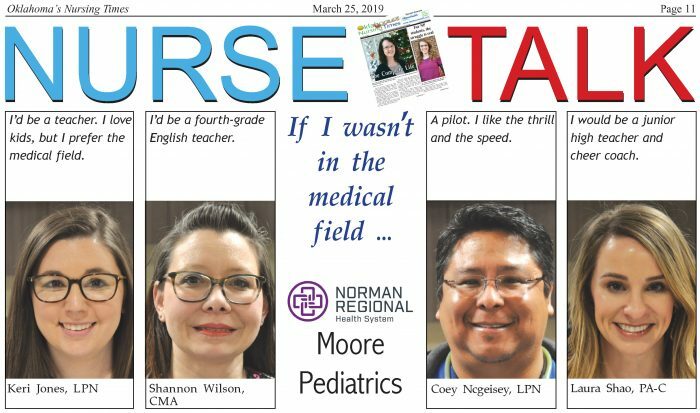 Riley Williams, RN at Mercy Hospital and Firefighter for Piedmont, OK is ready to help in emergency situations when the unexpected happens. Riley Williams, RN, works in the ER at Mercy Hospital and is also a Firefighter for the Piedmont Fire Department. 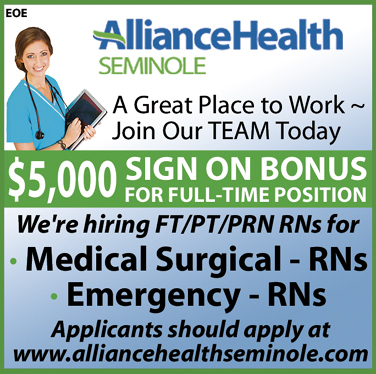 Both jobs require excellent medical skills and quick-thinking action in emergency situations. What did you want to be when you were little? “Actually, I never even thought about being a nurse. I always wanted to be a firefighter or a policeman. When I was in high school, my aunt worked at Mercy and I had an opportunity to work as a CNA. Things grew from there and now I know I was preparing for the job of an RN and a Firefighter was meant for me,” Riley replied. “Regarding the fire department, I was one of 343 firefighters doing the OKC 9/11 Memorial Stair Climb at the Chase Building; we climbed the 110 floors to honor the FDNY 343 and to commit to the promise of ‘Never Forget.’ This was my second year to do the stair climb and it is really a great feeling. I will continue to do it every year as long as I am able,” Riley commented. Life stays busy for Riley. 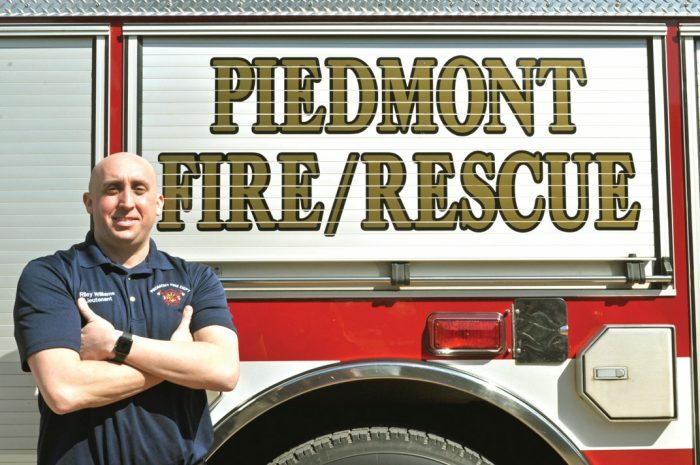 “Working at Mercy ER and being a firefighter for Piedmont Fire Department can get a little hectic at times,” he said. “I try to spend as much time as I can with my wife and our three sons, Luke – ten, Logan – eight and Lane four. Of course the boys are into sports, etc. My youngest one says he wants to be a firefighter like me,” Riley remarked. “I will always inspire my kids to be anything they want to be,” he added. Riley’s hobbies include fishing, hunting, golfing but most of all; he enjoys spending time with his family. When asking Riley to sum up his life in one word, he said that it would have to be “BLESSED”. 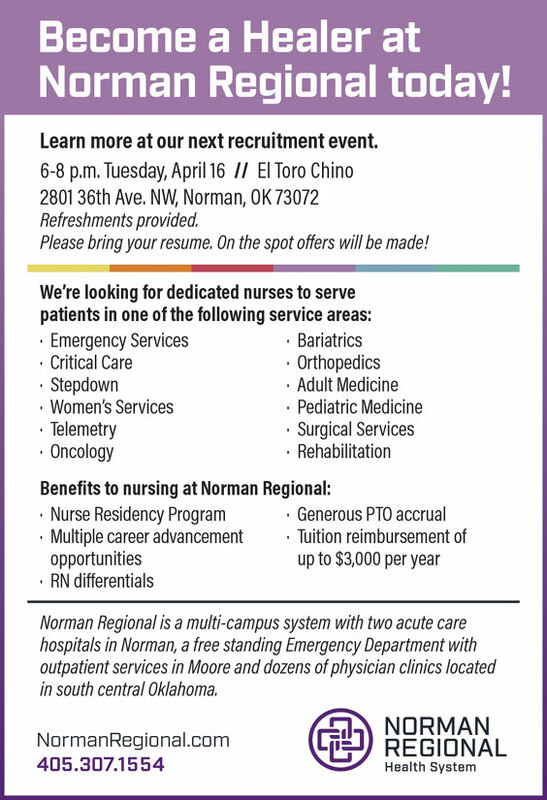 The OBU College of Nursing boasts a long and storied history of excellence in nursing education. 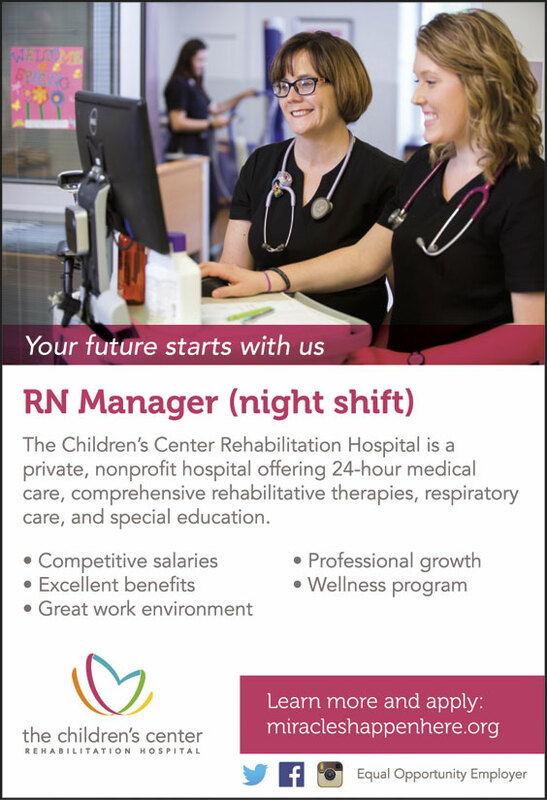 The College continues to build on its decades-long reputation for educating nursing graduates who are skilled and in-demand. 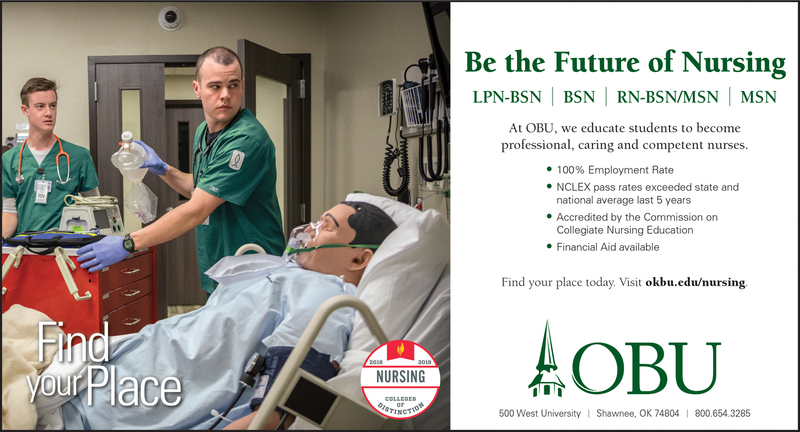 Always at the leading edge of nursing education, the OBU College of Nursing has been a trailblazer since its inception and continues that tradition of innovation and excellence today. In 1952, the Oklahoma State Board of Nursing approved OBU to launch Oklahoma’s first baccalaureate nursing program. This degree was the first four-year baccalaureate program for nursing in the state among all universities. The first graduating class included 11 nurses in 1956, and the OBU nursing program was accredited by the National League for Nursing in 1960. This accreditation continued without interruption until the School of Nursing affiliated with American Association of Colleges of Nursing, its current accrediting body. The College of Nursing now offers a Bachelor of Science with a strong liberal arts foundation, a BSN completion degree for nurses with an associate degree, an LPN to BSN, and a Master of Science in Nursing. OBU nursing alumnus Travis DeWall, ’16, offered his perspective on why he chose to study nursing at OBU. 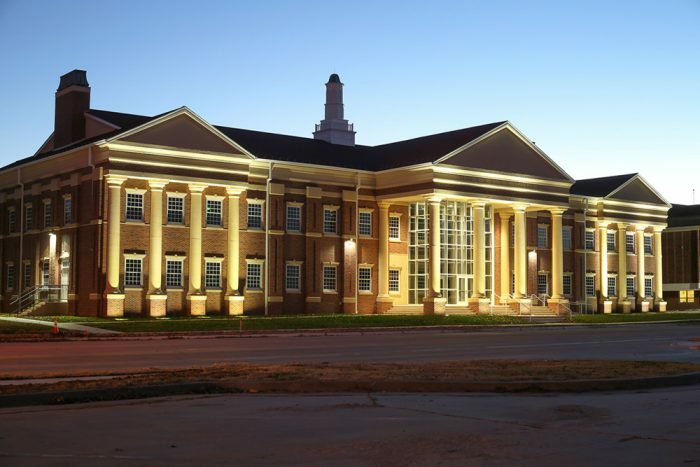 The OBU College of Nursing is housed in Jane E. and Nick K. Stavros Hall, a state-of-the-art nursing education facility. The building opened in 2016 and delivers cutting-edge nursing education for both undergraduate and graduate-level students. It includes five classrooms, a 109-seat lecture hall and a computer lab as well as spaces for students to study, meet and interact with faculty. The facility also includes six state-of-the-art, high-fidelity skills simulation labs, a medium skills lab, a health assessment skills lab, and a home health and bathing training room, totaling 24 beds. The facility is unrivaled in the state of Oklahoma, with its attention to detail and inclusion of real-world medical technology. This allows OBU nursing students to be ultimately prepared to enter the nursing workforce and prepares them more thoroughly for their careers than does any other higher education institution in the state. The College’s simulations labs are the crown jewels of Stavros Hall. Their technology, design and cutting-edge practices are second to none. These labs bridge the gap between learning and practice, placing students at the front lines of patient care, all while under the watchful eye of their professors. The high-tech simulation labs are equipped with the industry’s most advanced medical simulation solutions. Lifelike patient simulators are used to train students in various medical emergencies, allowing learners to acquire the clinical skills necessary to improve patient safety. Students have the opportunity to acquire hands-on practice using a birthing simulator, pediatric simulator and adult patient simulators. All simulation scenarios are recorded, allowing instructors to conduct debriefing sessions with students in which video recordings are reviewed so that students can receive necessary feedback for improving their skills. The training curriculum consists of single and multi-patient scenarios that include respiratory, cardiovascular, neurological, maternal-child, trauma, mass casualty and disaster situations. 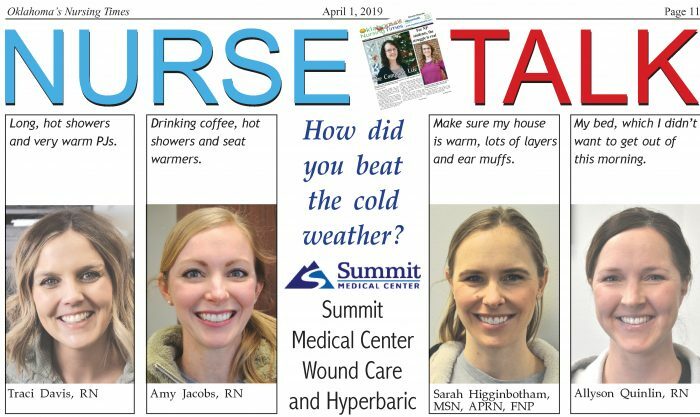 Patient simulators significantly enhance realism, as they can breathe, bleed, speak and even give birth to a lifelike baby that cries upon delivery. The lifelike devices also simulate complications and various life-threatening scenarios while allowing students to monitor vital signs and administer treatment. With the addition of this facility, OBU continues to lead the state of Oklahoma in nursing higher education, a position familiar to the College since its earliest days. 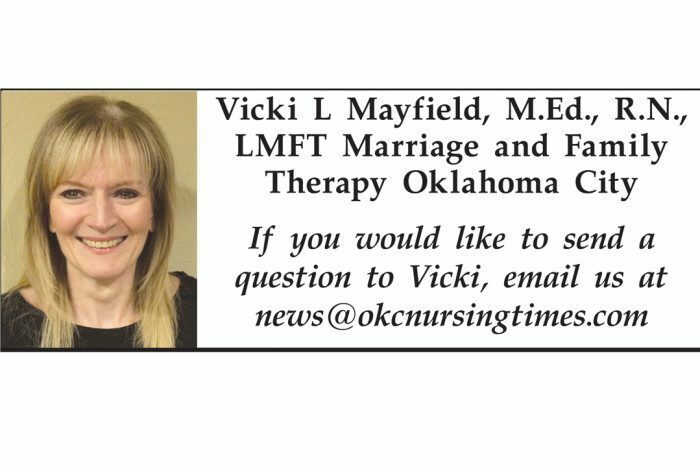 Heather Elliott, LPN is the Wellness Director of Iris Memory Care of Edmond. “I believe each nurse is given a gift. My gift is in Geriatrics.” Heather commented. Iris Memory Care of Edmond is the residential alternative to traditional Assisted Living. Unlike other Memory Care communities which have an access of 40 residents in a building, Iris Memory Care has two separate buildings that are built for a maximum of 20 residents each. All of the residents here have some sort of memory issues. Building A is for residents with severe memory loss and building B is for the residents that have a higher functioning level; able to participate in some of the activities on their own, yet still need assistance. Heather Elliott, LPN is the Wellness Director of Iris Memory Care and has been a nurse for 15 years. Heather was born in California and lived in Idaho, Nevada and graduated high school in Oregon. She moved to Oklahoma City 15 years ago and became a nurse. 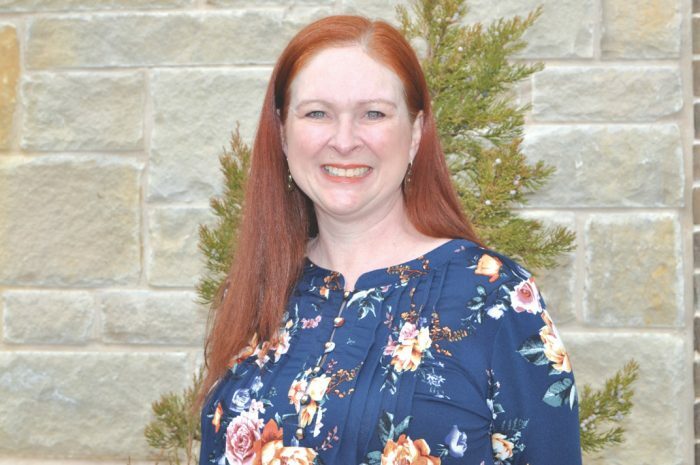 Heather has worked in several hospitals and several assisted living facilities and has been here at Iris Memory Care for a little over a year. “I like working in the assisted living facilities more than the hospitals. It lets me develop a relationship with the residents and their families. I enjoy getting to know them, going through the whole journey of their life,” she said. “It also allows me to be an advocate and the go-between if there is not a family member around. Sometimes, the caregivers that work here may be the only people they see. We try to make the resident’s stay here as comfortable as we can,” Heather added. What is your favorite part of the job? All of the residents here have memory issues. Most of the time, they don’t remember details of what’s going on. We see that confused expression on their face. Then, we see their facial expression relax and we know they feel safe. We try to deal with each resident in the best way we can,” she said. What is your biggest challenge? “I think that would be the way some of the residents try to hold on to their independence. Sometimes, it just can’t happen like that and the resident doesn’t understand why they can’t have everything just like it was before,” Heather replied. What are the qualities of a nurse or caregiver working in an assisted living home? “Working here at assisted living, the person would have to be very patient all the time. A nurse would need to have a genuine love from their heart. This is not a shift job! It’s a lot of work and a lot of time consuming stories that you will hear over and over but in the long run, it is a very rewarding, heartfelt job but it is all worth it in the end,” Heather answered. Heather’s biggest asset at work is making sure everyone has the right attitude going into their day with those around them. “We have very caring and loving workers here and I know all of us take care of the residents the best way we know how. Things run smoothly and everyone is happy,” Heather said. When I was little, I always wanted to be a lawyer. I guess I began thinking about being a nurse when I took my responsibilities a little more seriously. My nana was a nurse and two of my aunts were nurses. I thought I would give it a try. Now, I can’t see myself doing anything else. In fact, I see myself working in the medical field in five, ten years from now. I have a license for Administrator so perhaps, the Administrative Director of an Assisted Living Facility. Heather is married, has four kids, five grandkids and a grandchild on the way. “I like to spend as much time as I can with the kids and grandkids. My hobbies include reading, crocheting and taking care of my Huskie and St. Bernard, along with the many cats that we seem to accumulate,” she said with a laugh. Asking Heather to describe herself, she said that she is a wife, mother, grandmother and a caring individual. “I believe that God gives us all a gift and my gift is as a nurse. Not just any nurse though, a nurse that works in Geriatrics,” she replied. Heather’s words of wisdom are “Don’t give up on your dream and always remember, it might look like clouds outside but the sun is always there,” she said. Summing up Heather’s life in one word, OPTIMISTIC. Six law enforcement leaders in Oklahoma sent letters to either U.S. senators James Lankford (R-Okla.) or James Inhofe (R-Okla.), or both, urging them to support the recently introduced Excellence in Mental Health and Addiction Treatment Expansion Act (S. 824/H.R. 1767). This legislation will ensure that Oklahoma does not abandon the progress made in expanding mental health and addiction care by extending current Certified Community Behavioral Health Clinic (CCBHC) activities for two more years. 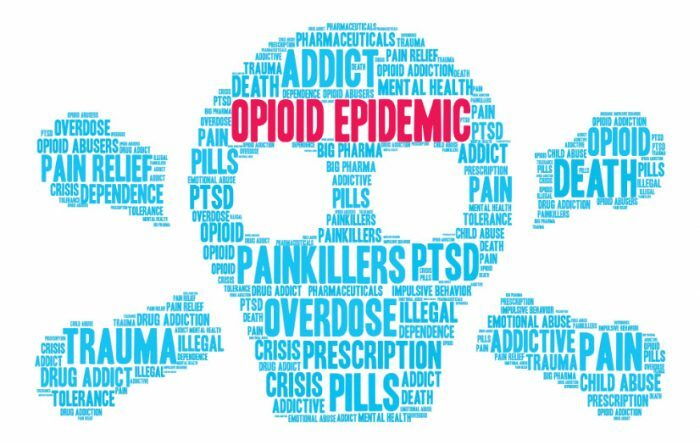 Rep. Markwayne Mullin, (R-Okla.) is a co-sponsor of the bipartisan bill and a strong supporter of efforts to expand mental health services and combat the opioid epidemic. The 2014 bipartisan Excellence in Mental Health Act established CCBHC demonstration projects in eight states, including Oklahoma. Since launching in 2017, Oklahoma CCBHCs have leveraged new funding to dramatically improve partnerships with criminal justice agencies to implement innovative interventions and increase access to community-based addiction and mental health care, particularly opioid addiction services. CCBHCs in Oklahoma have hired new addiction-focused clinicians, expanded medication-assisted treatment (MAT) and other addiction services and reduced patient wait times. However, with CCBHC demonstration funding set to expire on March 31, 2019, access to these lifesaving treatments in Oklahoma could be lost without immediate Congressional action. *Added more than 180 full-time staff, including psychiatrists, therapists, telehealth clinicians and substance use disorder treatment providers. *Served more than 40,000 individuals in Oklahoma with increased mental health services, substance use screenings, health care screenings and care coordination with primary care providers. *Ensured availability of same-day access for initial appointments at all three clinics. 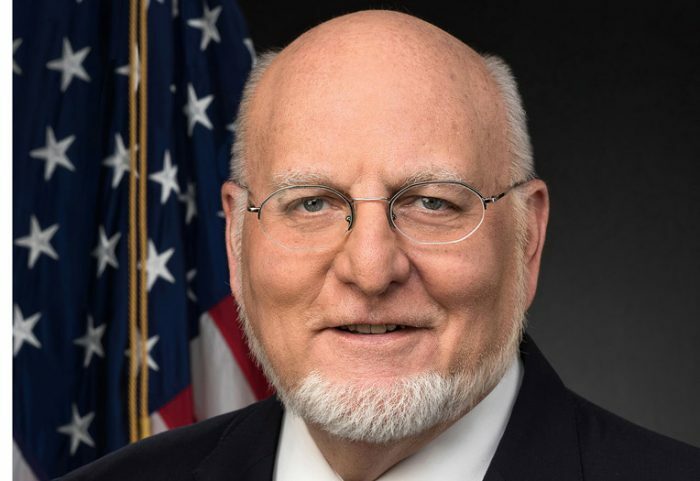 *Expanded the scope of their addiction treatment services to include increased availability of MAT for the treatment of opioid use disorder; every CCBHC now offers all three types of MAT, compared to only 36 percent nationwide. *Reduced inpatient psychiatric admissions by 95 percent in seven-counties in Northeast Oklahoma based on services provided by the largest CCBHC, producing as much as $15 million in estimated savings over three years. *Increased the number of veterans receiving care. *Partnered with criminal justice agencies to help reduce recidivism and with hospitals to decrease hospitalizations and improve care transitions. *Red Rock Behavioral Health Services: Serves more than 20 counties. *Grand Lake Mental Health Center: Serves 13 counties. 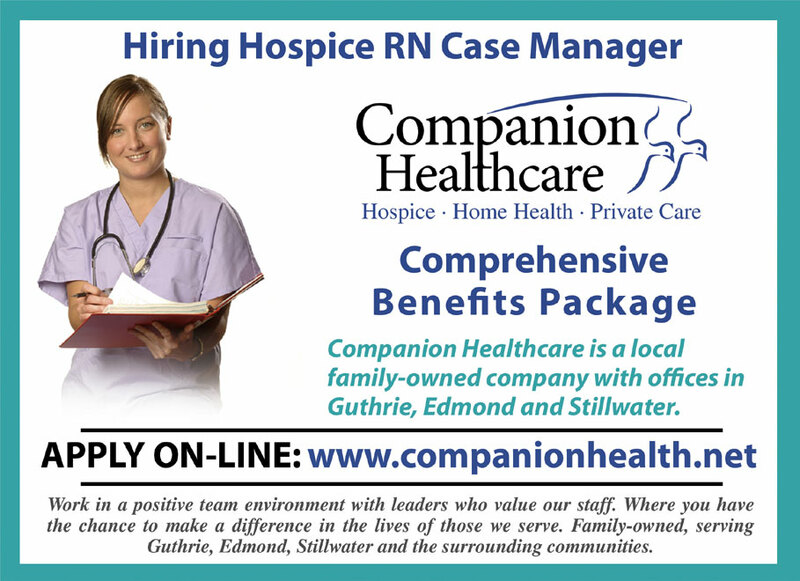 *NorthCare: Serves Oklahomans of all ages throughout all of central Oklahoma and neighboring counties. Q. I finally decided to end my severely dysfunctional marriage with a man that I now realize is a sociopath. He is making this extremely difficult because he is stalking my every move. I am scared he is going to hurt me. What is wrong with him? A. There are probably several things wrong with him. Being married to a sociopath is an experience you never forget and some of the scars will be with you for the rest of your life. *they want to exact vengeance and intimidate those who no longer worship them, want them, or obey them blindly. Stalking behavior is a common strategy that sociopaths use to intimidate their non-compliant victims and an effort to punish them and regain control. For their victims this is particularly difficult to deal with because stalking laws vary from state to state. It may not be easy to prove it is the stalker who slashes your tires, knocks down your mailbox or sends threatening letters. It is advised to take pictures, keep letters and inform the police that these situations are occurring. If your ex-husband has directly threatened you then it should be reported to the police. Do not play with this behavior. No one can successfully play with sociopaths. 1. Always report suspicious or threatening messages to the police. You can file for a victims protective order (VPO) if he has threatened to harm you. 2. Avoid being alone in parking lots or places where he can approach you. 4. Tell your family and friends what is going on, especially co-workers. He might show up at your job or be waiting for you in the parking lot. This situation is more common that you might think. MANY women have suffered from a relationship with a sociopath who sought revenge through stalking. Do everything you can to keep yourself safe and stay as far away from him as possible. 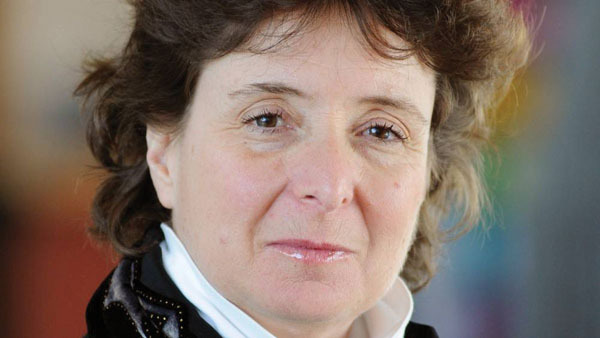 This year’s recipient is Judy Illes, Ph.D., a professor in neurology and neuroethics at the University of British Columbia. The University of Oklahoma College of Medicine will present its biennial award in biomedical ethics during an event Wednesday, April 3, at the OU Health Sciences Center in Oklahoma City. The award, called the Patricia Price Browne Prize in Biomedical Ethics, is presented to a person who demonstrates high standards in the medical or professional ethics fields. The prize is named for an Oklahoma champion of women’s and children’s health, the late Patricia Price Browne. The honor comes with a $10,000 award. This year’s recipient is Judy Illes, Ph.D., a professor in neurology and neuroethics at the University of British Columbia. She also serves as director of Neuroethics Canada, and is a faculty member at the Centre for Brain Health as well as the Vancouver Coastal Health Research Institute. Illes will give a lecture titled “Where the Children Lie in the Neuroethics Eye” during the OU College of Medicine’s Pediatric Grand Rounds at 12:15 p.m. April 3 in the Samis Education Center on campus. The awards presentation will follow. Illes received her doctorate in hearing and speech science and in neuropsychology at Stanford University. She became a pioneer in the field of neuroethics that was formally established in the early 2000s. Her research, teaching and outreach initiatives are devoted to ethical, legal, social and policy challenges at the intersection of the brain sciences and biomedical ethics. She has made groundbreaking contributions to neuroethical thinking for neuroscience discovery and clinical translation, specifically in the areas of neurodevelopment, neurodegeneration, brain and spinal cord injury, and more broadly to entrepreneurship in biomedicine and the commercialization of healthcare. During her time at the OU Health Sciences Center, Illes also will visit with faculty, residents and students to discuss ethics in medicine. Founded in 1910, the University of Oklahoma College of Medicine trains the next generation of healthcare professionals. With campuses in Oklahoma City and Tulsa, the College of Medicine offers the state’s only Doctor of Medicine degree program and a nationally competitive Physician Assistant program. For more information, visit oumedicine.com/collegeofmedicine.